Most of us have heard of the concept “Big Bang.” It refers to the unique event that launched the universe on its evolutionary journey. Until the first third of the 20th century, the common assumption about the universe was that it was eternal. It always was and always would be. We also thought that the universe was probably no larger than the Milky Way. Then the astronomer Edwin Hubble measured the red shift of distant stars and realized that the further stars were from us the faster away from us they were moving. He reasoned, correctly, it turned out, that if galaxies were moving away from each other, they must be moving from a place where they were close together. He did what scientists do – made some calculations – and concluded that there must have been a time when everything was all together in one place. Another great scientist, firmly convinced of the eternity of the universe, Fred Hoyle, made fun of Hubble’s theory by calling it the “Big Bang.” The name has stuck. Experiment after experiment, in different parts of the world, on different aspects of the universe, have convinced scientists that such a “Big Bang” was no preposterous suggestion, but, in fact, the way creation most likely happened. It has been hard for Christians not to jump up and down saying “I told you so!” Sober reflection does suggest that Creation, from nothing, by a Creator, is not out of the realm of possibilities, given the scientific evidence. This is not territory for the scientist, as we have established, but for the theologian and the believer. But before we run off in all directions with this vindication of an ancient belief, let us consider some implications. 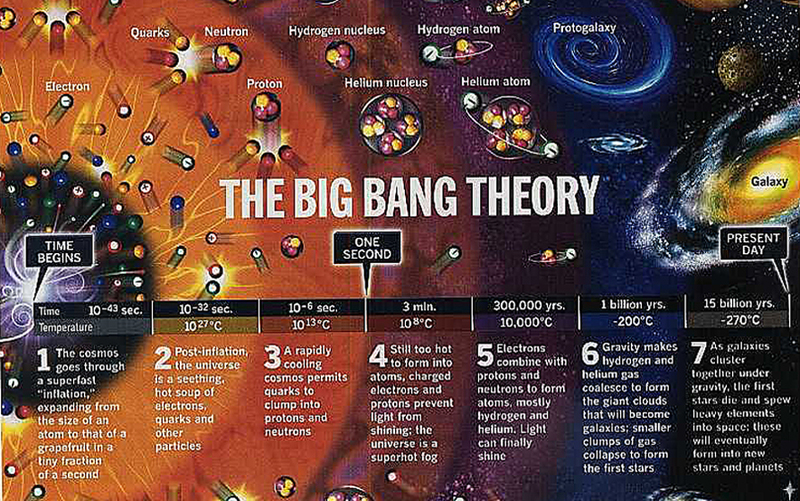 The “Big Bang” not only created matter (or energy), but space and time itself. . It would not be foolish to begin this meditation by remembering the first line of the Prologue to the Gospel of John: “In the beginning was the Word and the Word was with God. And the Word became flesh…” We have tended to see these words as applying to Jesus of Nazareth. But what if we took a cosmic perspective, and used the images of the “Big Bang” to meditate on this passage? What image of God is vast enough to allow for such a Big Bang imagery? Reflect on other aspects of your belief system – your understanding of evil, your belief in the power of prayer, your belief in God’s closeness to you, for instance. How would they be affected by this notion of God? One of the more recent attempts to make sense of this incredible universe we find ourselves in suggests that the Universe is the concrete actualization of God’s infinite potential in space and over time. As the great mystic Hildegard of Bingen said, we are not only made by God, we are made of God. Think about that for a moment…How do you feel about all this? It might even be useful to consider that the “Big Bang” occurs (metaphorically) “within” God. More specifically, within the Trinity. Perhaps we could even imagine that the “Second Person” of the Trinity is the Beloved, the Universe (whose name is Christ)… But more of that later.